Reviving Al-Islaam: Qur'an: Created or Uncreated? One of the most heated discussions that you will see within Shee`ah and Sunnee circles is whether the Qur’aan is “Created or Uncreated”. These futile and frivolous discussions used to be happening during the time of the our Imaams (عليه السلام) in which our Imaams have addressed this issue very clearly and eloquently, leaving no room for deviations. 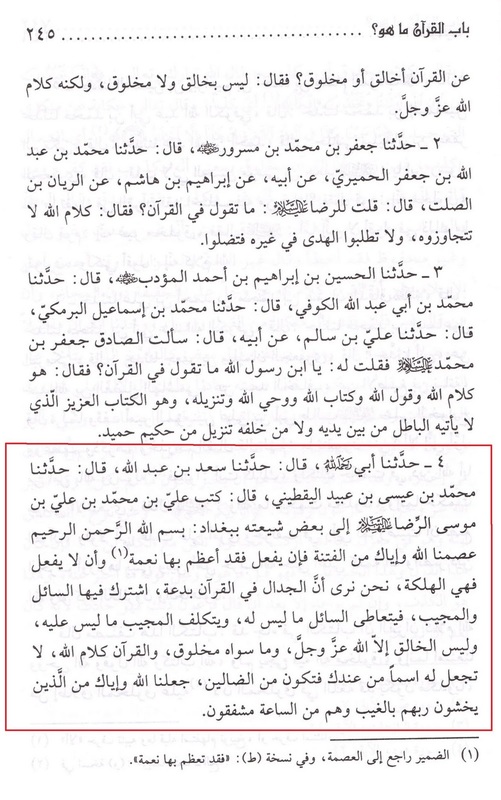 Here is a SaheeH hadeeth in which our Imaams call this argument (discussion) about the Qur’aan as bid`ah, and that we should not put a “name” to the Qur’aan from our ourselves. 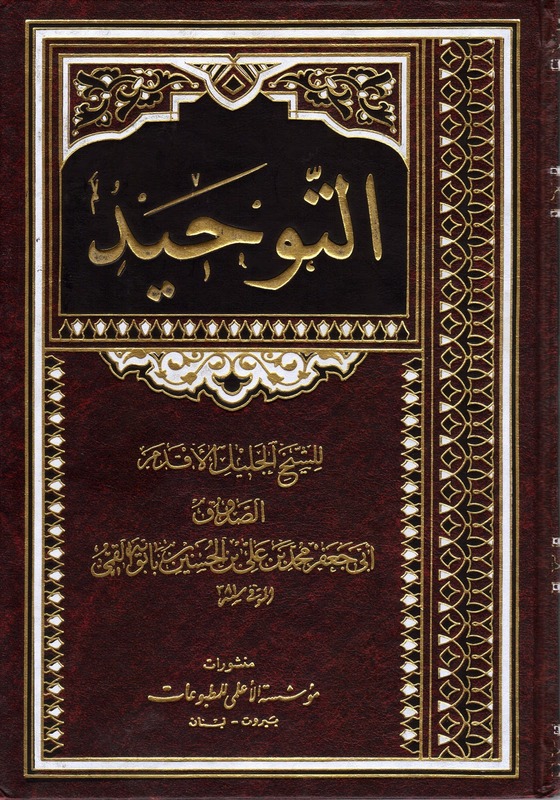 Whatever Allaah (سبحانه و تعالى) has named his book that is the only name we can give it. All of the narrators in the chain, which is very short, are thiqaat (pl. thiqah). حدثنا أبي رحمه الله، قال: حدثنا سعد بن عبد الله، قال: حدثنا محمد بن عيسى بن عبيد اليقطيني، قال: كتب علي بن محمد بن علي بن موسى الرضا عليهم السلام إلى بعض شيعته ببغداد: بسم الله الرحمن الرحيم عصمنا الله وإياك من الفتنة فإن يفعل فقد أعظم بها نعمة وإن لا يفعل فهي الهلكة، نحن نرى أن الجدال في القرآن بدعة، اشترك فيها السائل والمجيب، فيتعاطى السائل ما ليس له، ويتكلف المجيب ما ليس عليه، وليس الخالق إلا الله عز وجل، وما سواه مخلوق، والقرآن كلام الله، لا تجعل له اسما من عندك فتكون من الضالين، جعلنا الله وإياك من الذين يخشون ربهم بالغيب وهم من الساعة مشفقون. He said: “`Alee bin Muhammad bin `Alee bin Moosa Al-RiDaa (عليه السلام) wrote to some of his shee`ahs in Baghdad: ‘In the name of Allaah, the Most Beneficent, the Most Merciful, May Allaah protect us and you from this fitnah, and if He does, then it is a great blessing, and if He does not then it is a disaster. Our view is that the argument (discussion) about the Qur’aan is bid`ah, (both) the questioner and the answerer share (in responsibility). The questioner gets into (something) he should not, and the answerer is constrained into what is not (true). why do u say taken from my personal copy ? Maybe this hadith is only for that point in time???? Because so many grand scholars have discussed this topic! It would be illogical to believe that all of them either din't know about this narration or went against it.